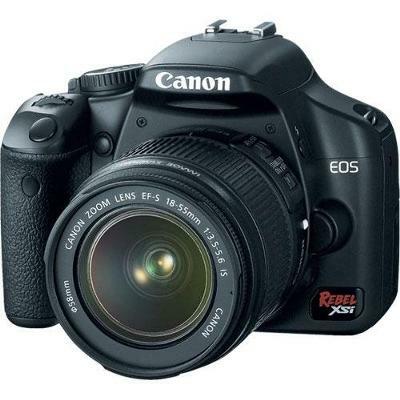 I bought the Canon Digital Rebel XSi because I’ve owned various Canon cameras for many years. Mostly they were point-and-shoot cameras from the PowerShot series. I liked the styling, and I respected the optics. Canon has always been a good, reliable brand. So when I decided to upgrade to a digital SLR camera, Canon was obviously a brand I looked at. I did my homework and read a lot of review articles. Nikon also had a strong DSLR out at the time, but I thought the Canon Digital Rebel XSi sounded better. Of course, all of the articles talked about how low prices were for these types of cameras, but I guess they were comparing them to the costs of professional SLR cameras and lenses, because the prices didn’t seem that low to me! But I shopped around online, looked at discount sites and even checked out listings on eBay. I eventually purchased a Canon Digital Rebel XSi kit, which came with a EFS IS 18-25mm lens, for $600. I’ve had the camera for two years now, and couldn’t be happier. In the two years I have owned the Canon Digital Rebel XSi digital cameras, I have experienced only one hardware problem. I don’t use an external flash and rely on the Rebel’s built-in pop-up flash module when extra lighting is required. After I had owned the camera for about a year, that pop-up module began to stick. I had to assist it in opening with my fingernail, or else it would return an error message and I’d have to shut it off and turn it on again to clear it. cue tip and wiped the sliding hinges clean. I’ve never had that problem again. To be fair, I live in a house with cats and their fur gets everywhere. If I were to cite a drawback of the Canon Digital Rebel XSi – and I’m hard pressed to come up with one – I would say it’s the lenses. Canon lenses are fine, but you have to buy the right ones. Not being an SLR photographer, I started out not knowing much about the lenses and I didn’t make all good choices at the beginning. The camera came with an EFS IS 18-25mm lens, which is a very good general purpose lens. It will autofocus or can be set for manual focusing, and that IS stands for image stabilization. THAT is an important feature. Some cameras have an image stabilization feature built into the camera body. Canon does not. Instead, they put the image stabilization function into the lenses (or not.) When photographing a subject up close, or in bright light, image stabilization doesn’t make much difference. However, I also bought a telephoto lens, a Canon EFS 75-300mm, without image stabilization. When photographing wildlife at a distance, not using a tripod, the images were always blurry. When I used a tripod, they were crystal sharp. So, I sold that lens on eBay and purchased a much more expensive one with the IS feature. Canon lenses feature USMs (ultrasonic motors) which drive them during the autofocus. Really expensive lenses have one type of USM, which is fast, but Canon also markets much cheaper (although still expensive) lenses with a different kind of USM that doesn’t focus as quickly. I’m not a professional photographer, and the $200-$300 lenses work just fine for me. However, it does cause a lot of anxiety when I’m looking for a lens to buy, because while I don’t need professional quality, I do want to end up with something I’m happy with. Overall, the Canon Digital Rebel XSi is a fantastic camera, and I’d buy it again in a heartbeat. Now, of course, two years after my purchase, I’m sure they only sell newer models. Based on my experience with the XSi, I’m quite confident you would be equally pleased with newer versions also.